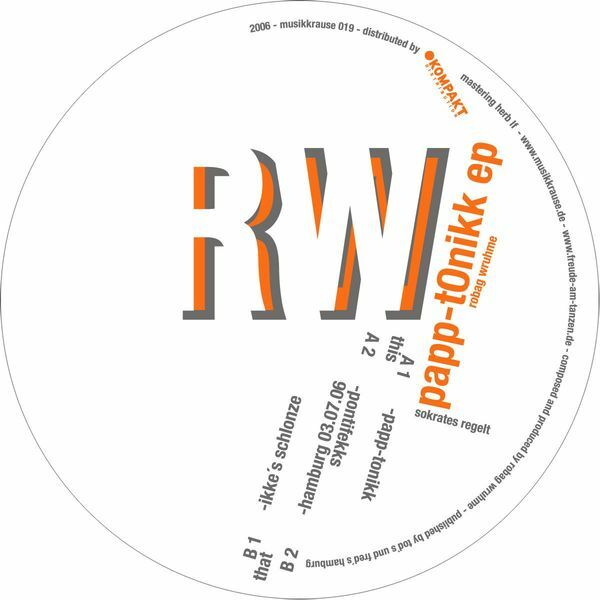 Its been far too long since we've had anything out of the Robag production bunkers - Papp-tonikk cleaves to his well described, usual percussive, minimal boogie - relentless and altogether scintillating. "Pontifekks" adopts a more electroid house take ata similar tempo to prime cut up effect - a wicked track to make busy with on the cross faders. "Ikke's schlonze" sports one of those jazz not jazz drum breaks which always proves such a hit on worldwide floors with exotic ladies and beardy lads - huge walking upright bass vamp as well, trims the goatee and rights the beret to the correct position - the return of credible jazz house? In stark contrast "hamburg 03.07.06" enters horizontal deep space - cosmic ambient music for the flotation tank: in short, something for everyone on this incredibly varied but deeply consistent four tracker.